Update, the Kickstarter is live! I'd love if you'd take a look and share! I'm supporting two backer tiers, Sketchy Citizen -Kristy Cunningham version, and Square City Citizen Bundle - Kristy Cunningham version. In both of these, you get a sketch commission by me as part of the deal. Sorry for so long with no communication! I've been busy with my work's summer releases and wrapping up my contribution for Square City Comics's 3rd anthology. This has by far been one of the most emotionally challenging comics to work on. I am also quite happy with how it turned out. 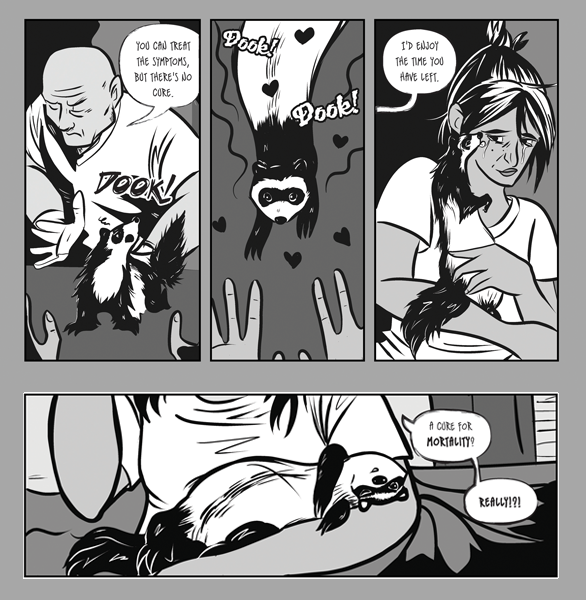 When my ferret Paulie passed away, I wanted to deal with it in comic form and the anthology provided a unique opportunity. Our Kickstarter is live and I hope you'll support it! There are a lot of great creators, and the theme, a cure for mortality, is a brilliant one. Now that I am finished with this comic, I will be returning to Infinite Spiral work. I'm taking a vacation this week (all analog, no digital art), and then will resume pagework where I left off. Thanks for your patience. If you want to see what I've been sketching in the midst of stress and an emotionally intense project, I have a new sketch tumblr: novemberkris.tumblr.com. I also regularly post sketches not seen here and enterthespiral.tumblr.com. As always, thanks for your support and I look forward to sharing new pages in September!